First off, I didn't do so well with mashing the garlic into a paste, as you can see. I think my problem was not using enough salt. Ah well, it still tasted great. 2. 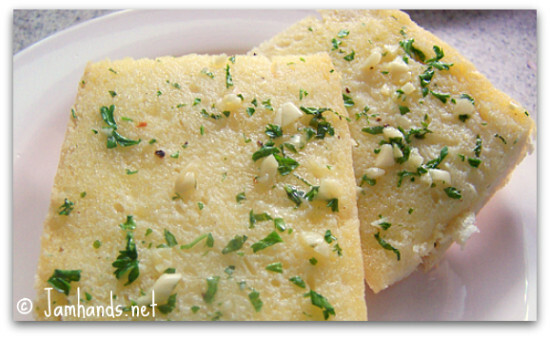 For the bread, stir together the butter, mashed garlic, and herbs in a small bowl and season with salt and pepper. Tear open the loaf of bread lengthwise, spread the herb-garlic mixture over both halves and sprinkle with a little olive oil. Bake for 15 minutes. Looks good, but I'm not that patient..I toast my bread first..then just rub a clove of garlic over the crusty bread...I'd season my olive oil with those herbs for dipping...great flavors! For a special dinner I might do it your fancy way. Such a nice recipe! I bet if you just ran the garlic through a garlic press it would be a lot more "smashed." I can't even imagine smashing it by hand! Too much work for this girl.